Last week wasn’t too interesting for the stocks, forex and commodities markets. The holiday in the U.S may have contributed to the slow paced movement in those markets. Gold and silver weren’t any different and both precious metals prices remained nearly flat during most of the week. Both bullion rates rallied on Friday, perhaps on account of the end of the month trades and low volume of trade. Specifically, the trade volume fell by nearly half during Friday compared to previous days. In the U.S, jobless claims fell by 10k to reach 316k; building permits increased by 6.2% during October. But not all the news items were positive: Consumer confidence index fell by 2 percentage points; pending home sales fell by 0.6%; new orders of durable goods decreased by 2% during last month. These reports paint an unclear picture regarding the progress of the U.S economy. 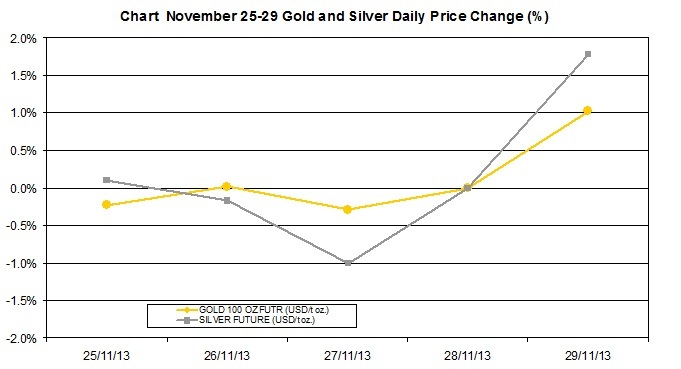 This mixed signal may have contributed to the unclear trend in the precious metals market. 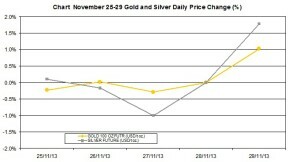 By the end of the week, gold price rose by 0.51% and silver by 0.69%. The price of gold slightly rose by 0.51% last week; on the other hand, during last week, the average price reached $1,241.74 /t. oz which was 1.32% lower than last week’s average rate of $1,258.3 /t. oz. Gold ended the week at $1,250.50 /t. oz. The price of silver, much like gold, rallied by 0.69%; conversely, the average weekly rate was $19.81/t oz, which was 1.51% below last week’s rate $20.11/t oz. During last week, the average daily percent shifts of gold were 0.104%; silver had an average daily change of 0.142%. 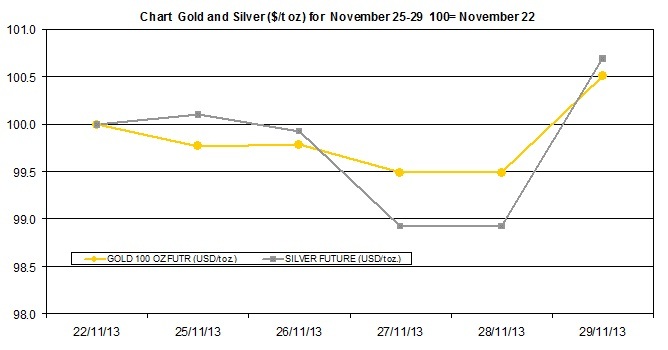 The chart below shows the changes in bullion prices, in which they are normalized to 100 as of November 22nd. 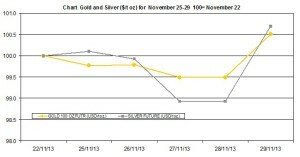 Gold and silver remained nearly flat during most of the week. The second chart presents the daily percent shifts of precious metals prices (or in other words the changes around the trend). Silver and gold moved in an unclear trend during the week. Gold and silver prices declined Wednesday only to rally on Friday. The daily percent shifts ranged between 1.8% gain and 1% drop. Is Silver Wheaton Able to Turn it around? Could These Gold Producers Surprise You?